WE KNOW WHERE THE HIGH QUALITY ROADS ARE. About 70% of the roads in more than 70 countries in the world need total and gradual repairing, maintenance of roads, as well as constant monitoring of road surface. Every day, millions of drivers and their vehicles suffer from the poor state of the road surface. Many of them get into accidents because of the terrible condition of the roads. Our service provides an opportunity to assess the condition of the road surface and to plan trips on the roads with a high-quality covering. [bvblogic] - a leading IT company in Western Ukraine. Mobile applications. Navigation technology. Navigators. Cartography. Big data. Open data. The challenge in the realization of the project was on the stages of scaling of the service Navizor, when there was extreme increase of the amount of users from different countries, and as a reason there was intense load on the servers and databases. The realization of navigation functions in mobile applications was also not easy. 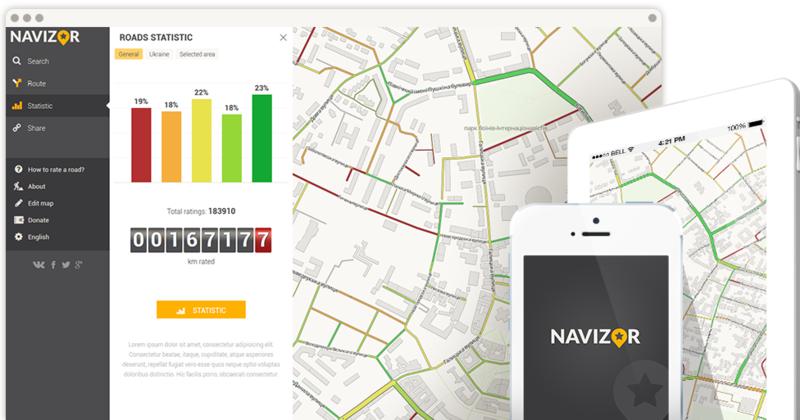 Navizor is the first in the world mobile navigator, which allows to plan the routes taking into consideration the quality of the roads and warns drivers about dangerous areas of roads ahead. We have developed intelligent algorithm for calculation the quality of the road covering, which is self-improving. On our service you can find the most precise and experienced information about the roads quality, proven in practice by the drivers. Service is easily scaled, we have been working already with 37 countries from all over the world. This service helps to save up to 15% on fuel expenses and repair of car suspension. The service Navizor works in 37 countries of Europe and Asia. More than 240 000 km have been rated by more than 80 000 users.